It seems our brains aren’t very good at distinguishing big successes from small successes. Often, we’ll enjoy as much emotional and mental reward when we succeed at something simple as we do with large wins. So, in your life and organization, orchestrate a series of small wins to generate “success momentum”—the feeling you get when you succeed over and over. For instance, if you know you’re going to have a challenging day, perform a series of small wins to build momentum and to increase confidence and resiliency. This strategy will combat procrastination and complacency, and will provide a growing sense of satisfaction and control. If your organization is stalled or when you’re launching a new product or service, you can generate momentum by designing, accomplishing, and celebrating a series of small wins. Here’s a great example of the benefit of small wins. William H. McRaven, a retired U.S. Navy four-star admiral and former commander of the U.S. Special Operations Command, is now chancellor of the University of Texas System and leads one of the nation’s largest and most respected systems of higher education. On May 17, 2014, McRaven delivered the commencement address at his alma mater, University of Texas at Austin. In his speech, he gave 10 suggestions on how to change the world. His first point was: make your bed. “Every morning in basic SEAL training, my instructors, who at the time were all Vietnam veterans, would show up in my barracks room and the first thing they would inspect was your bed. If you did it right, the corners would be square, the covers pulled tight, the pillow centered just under the headboard and the extra blanket folded neatly at the foot of the rack—that’s Navy talk for bed. If you make your bed every morning, you will have accomplished the first task of the day. It will give you a small sense of pride and it will encourage you to do another task and another and another. By the end of the day, that one task completed will have turned into many tasks completed. Making your bed will also reinforce the fact that little things in life matter. If you can’t do the little things right, you will never do the big things right. Making your bed every morning is a simple example of how small wins can be used to generate momentum and can lead to larger accomplishments. Take advantage of the power of small wins. Here’s a video of McRaven’s speech at U.T. Austin. Many people don’t know how to properly express their anger. They either stuff their anger or spew it. Said differently, some hide it, others hurl it. Said again, some people are like turtles (when conflicts arise, they pull into their shells), others are like skunks (when challenged, they spray nasty stuff). Stuffers are often reluctant to even admit that they’re angry and have a hard time expressing their anger. Spewers are just the opposite; when they’re upset, they let you know, and it’s usually not pretty. Aristotle’s statement (see above) teaches a wholesome approach to anger. When you’re angry, express it, don’t stuff it, but do so in a proper way—don’t spew. Getting angry is often unavoidable and, at times, healthy and the right thing to do because it is our natural response to pain and hurt. Get angry over child trafficking; don’t get angry when your newspaper gets wet. Get angry when politicians lie; don’t get angry when your two-year-old knocks over his milk. When you get angry about something that happens at work, don’t take it out on your spouse or children when you get home. It’s immature, unfair, and irresponsible to flail on someone who was uninvolved in the situation that made you angry. 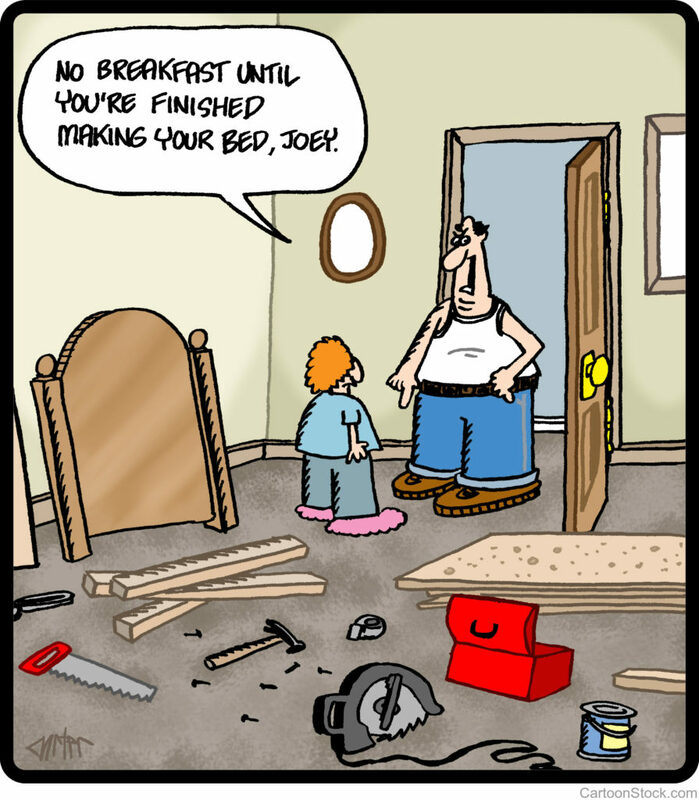 If your kid forgets to make his bed, don’t go ballistic. If he sneaks out at night and wrecks your car, go ballistic. Even right words can be inappropriate when spoken with an improper tone of voice, so be careful not only about what you say but how you say it. 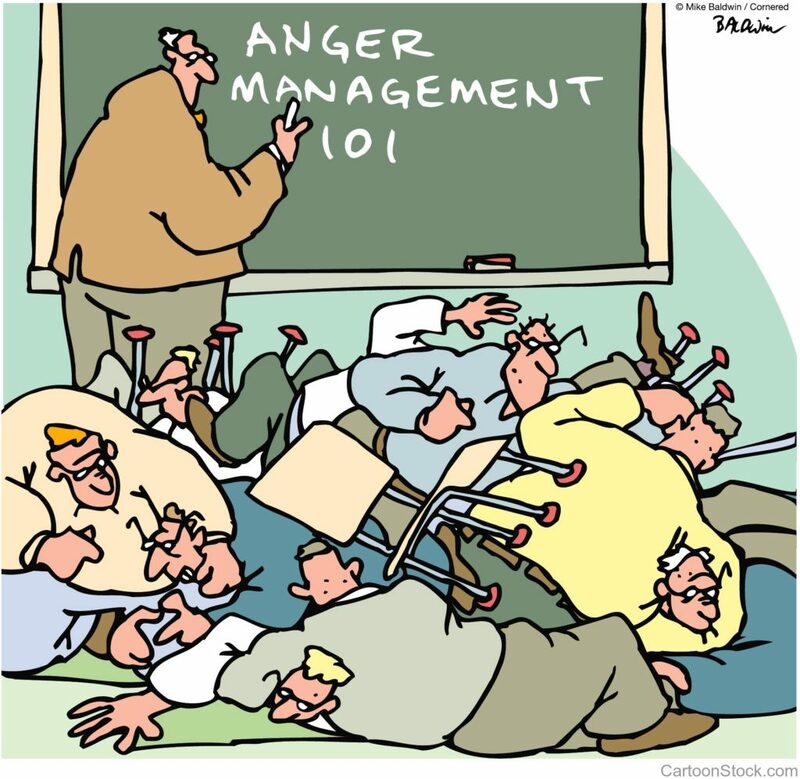 Here’s some good advice on how to manage your anger. Here are some characteristics of trust. Trust is earned; you can’t buy it or obtain it through coercion. It takes time for trust to develop and it doesn’t come quickly. 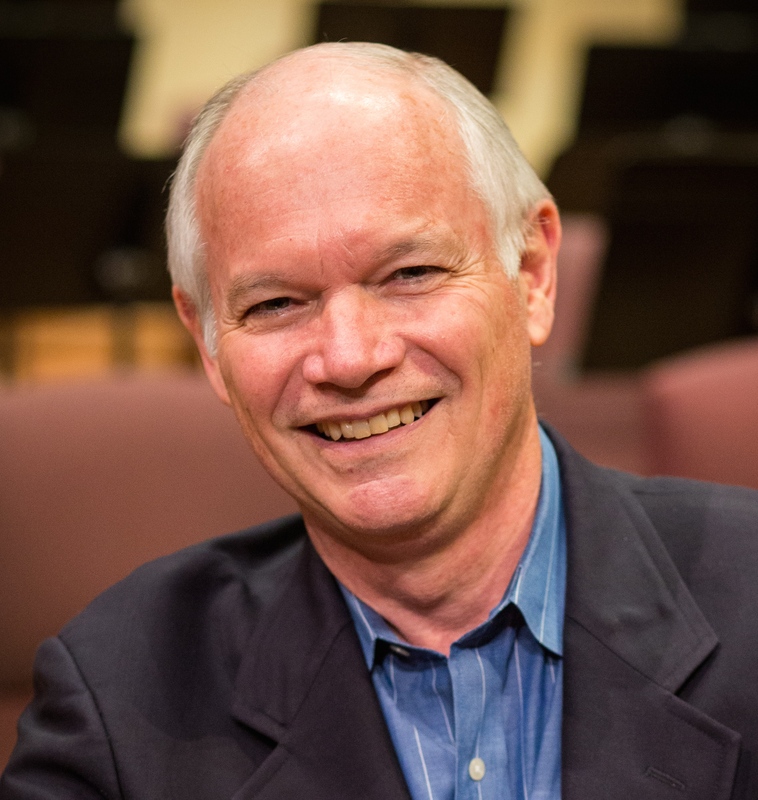 When you assume a new position of leadership, your good reputation of being trustworthy may help jumpstart the trust factor with your new team members but inevitably they will need to see you in action and to experience, firsthand, your trustworthiness; and that takes time. Trust is built and maintained by hundreds of small and large actions over time. 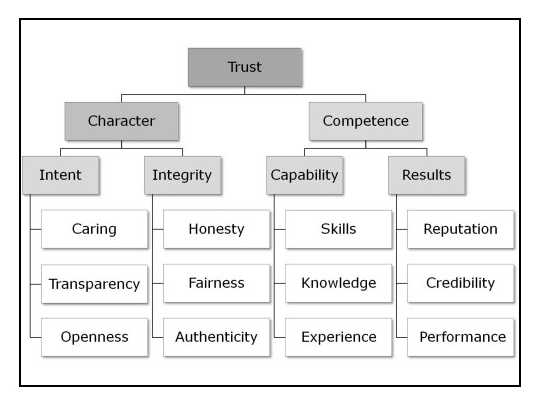 In leadership, trust is built on two pillars: character and competence. To be a trustworthy individual, only one is needed: character; but to be a trustworthy leader, you must exhibit both character and competence. Skills – do you have the necessary skills for your trade? Knowledge – do you understand the basic principles of what makes your organization work? 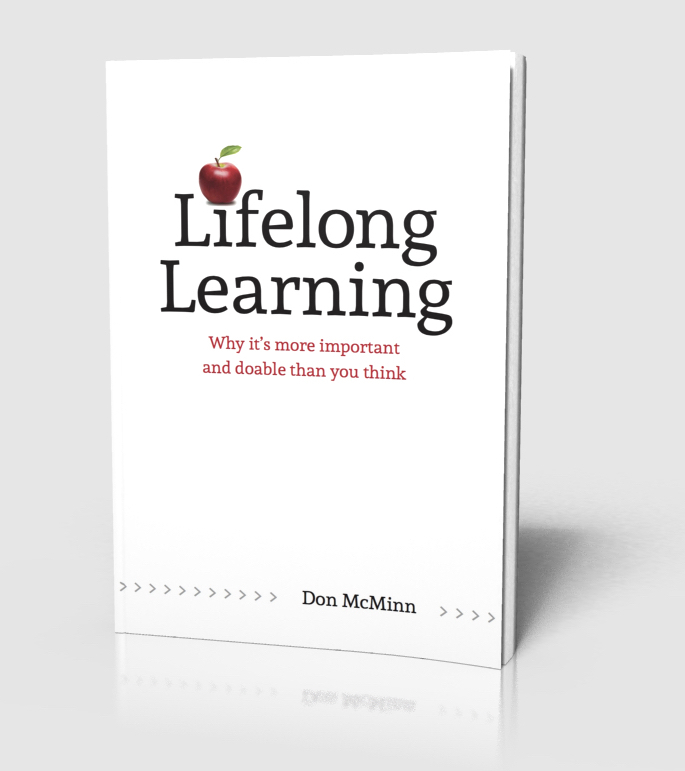 Experience – is your knowledge only theoretical or has it been proven experientially? Reputation – the sum of all your work and leadership experience. Credibility – reliability; your ability to produce over time. Trust alone won’t make you a great leader, but without trust you will never be one. Click here for information about the September 27-28 Lead Well workshop. Imagine that you’re in a dark auditorium and suddenly a spotlight is turned on. It is bright and clearly illumines the area it shines on. But it is a limited area and someone is controlling where you are looking. A spotlight has a narrow focus. Though a spotlight does illuminate reality, it only reveals a small part of reality—your attention is drawn to, but limited to, a narrow range. In a dark space, you’re essentially blinded to all the space other than what the spotlight’s beam shines on. 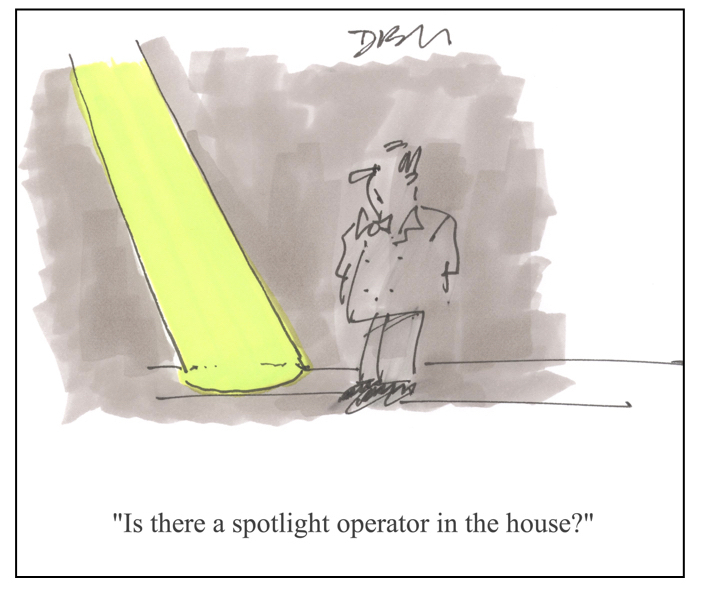 A spotlight is vulnerable to bias. Someone (the spotlight operator or the director) has predetermined what the light will focus on; someone else has determined what you will see. In essence, you are being manipulated. When there is ample general lighting, you can choose what you want to focus on, but in a darkened room where there’s only one beam of light, your focus is determined by others. Now let’s apply these thoughts to life outside the theatre. Sometimes in life we’re manipulated into focusing on a particular issue. When you listen to a news broadcast, the topics have been decided in advance and are usually presented in a biased way. In a meeting that has an agenda, someone has predetermined what issues will be discussed. In conversations, someone may consciously or unconsciously choose the topics that are discussed. Sometimes in life we inadvertently, and to our detriment, choose to focus on a singular issue. We may focus on one aspect of our lives to the exclusion of the bigger picture. We often do this when experiencing pain or hardship—we obsess on one part to the neglect of others. Or, we may become preoccupied with a single goal, one that doesn’t deserve our exclusive attention. Leaders, understand the power of this principle and use it for the good of your organization; don’t abuse it or let others abuse it. Keep your eye on the entire organization which will enhance overall organizational health and maintain balance and fairness. Don’t fall prey to the spotlight syndrome or cause it. 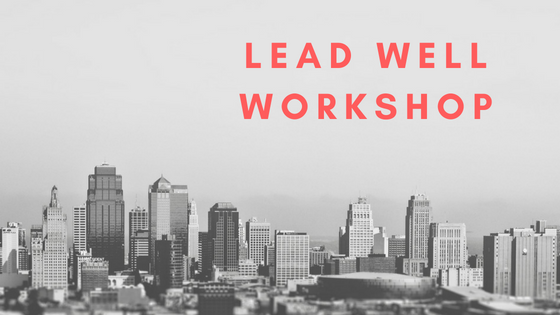 Click here for more information about the September 27-28 Lead Well workshop.